This document was the catalyst for the black student activism in the fall of 1968. The first list of demands from SASS was drafted in response to Dean Hargadon’s decision to place this report in General Reserve for public review. The decision to include this document in the digital archive despite its sensitive nature is rooted in the understanding of the significant role the report, and the ideological underpinnings of the study, played in the political and social unrest at Swarthmore College. The document has been reproduced in its entirety save for minor redactions made to safeguard the identification of specific individuals. 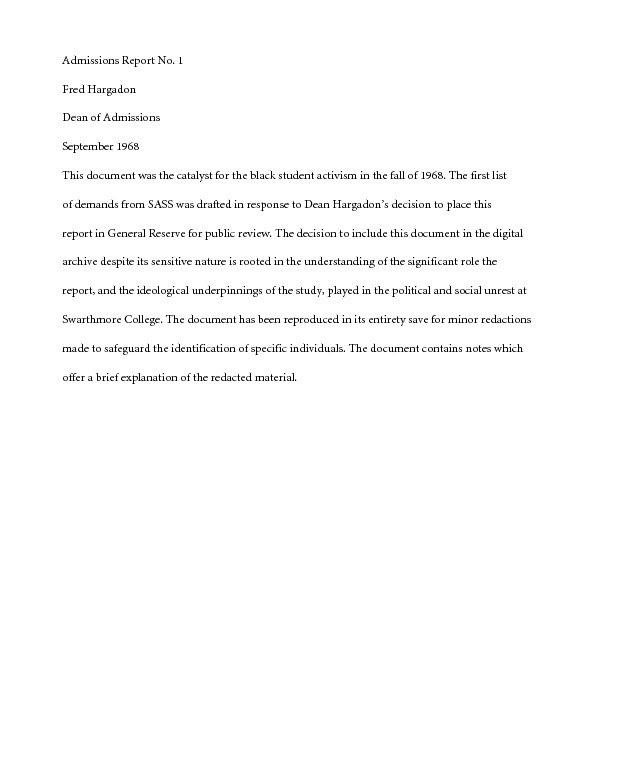 The document contains notes which offer a brief explanation of the redacted material.